What is a Workbook? - Psycholinguistic Technologies, Inc.
A SentenceShaper workbook is a series of screens, or “pages”, each with its own picture, spoken prompt, and word-finding support. When you run a workbook, you create speech on each page. Workbooks can zero in on particular linguistic structures or help you create speech about your life. SentenceShaper 2 comes with some built-in workbooks. For example, there is a workbook for practicing sentences with prepositions. Shown below is a screenshot of the first page in this workbook. Note: To enlarge the screen shot below, click on it. Then use your browser’s back arrow to return to this page. 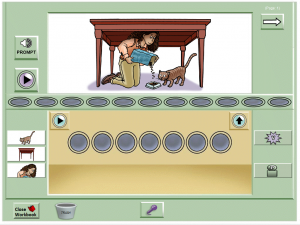 The main picture shows a woman feeding a cat under a table. The user’s task on this workbook page is to create a sentence describing the picture. The smaller pictures below it are on Vocabulary Cue Buttons, which give word-finding help for this page. So if you click the button with the picture of a table, it will say “The table”. You then record it in your own voice to add it to your sentence. On the upper left, there is a button marked “Prompt”. This plays a sound file associated with this page. 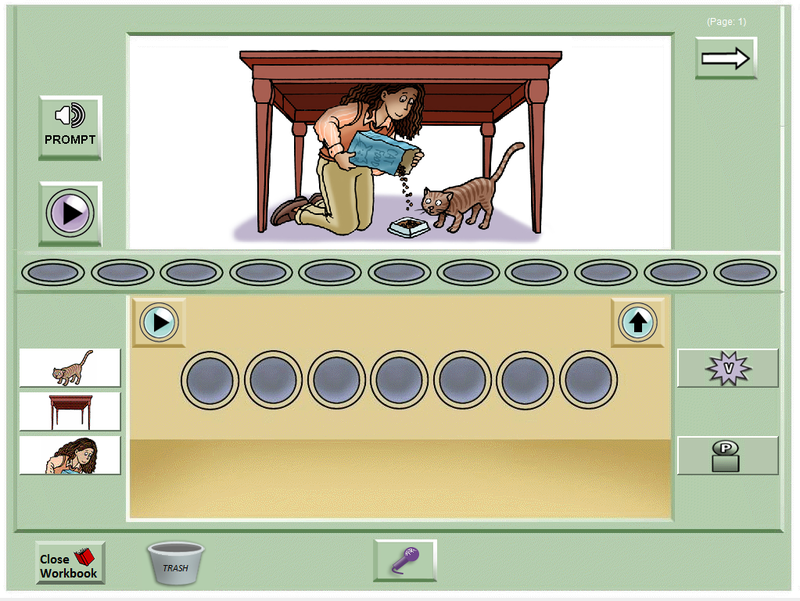 It can be an instruction (“Please describe this picture”) or a model of the target sentence (“The woman is feeding the cat under the table”). On the upper right, there is an arrow to take you to the next page in the workbook. Every page in this workbook has these elements: a main picture, some Vocabulary Cue Buttons with their own small pictures, and a Prompt Button that plays a description of the picture. So that’s all there is to workbooks. They are collections of pages like this, and the user goes from one page to the next by clicking the arrow.